Discussion in 'Music Corner' started by siebrand, Feb 12, 2019. The Slade were one of the main groups of the "Glam Rock", an English musical movement that used to show off on stage using very showy clothes, very special, often bulky and shiny gold and / or silver. The Slade were very famous in England, but also in other European countries (Austria, Germany, Sweden, Holland, Switzerland and ...). It is still the group that sold (after the Beatles, of course) more "singles / 45 laps" in the history of modern music. Their Rock was defined, then, "Hard Rock", even if now we can perhaps smile at that statement. The Glam Rock had many admirers, many were the groups to have, at least sometimes, joined the movement. David Bowie ... who does not remember his funny clothes, showy, but ... always, besides showy, even elegant? yet .... that "HonkeyTonk" music, light, pop (here we find, on 12 tracks, only 3 songs catalogable as "hard Rock"). it was really nice. Would you like to talk about GLAM ROCK ? tages, Randoms, Sound of the Suburbs and 1 other person like this. This is a genre that never did much for me, personally. Of course, I know and like the classics - T.Rex, Mott the Hoople, Bowie to a certain degree (Ziggy is one of his weaker albums for me) - but being born almost 30 years after Glam happened, the whole attitude and the style are very weird. And the music doesn't quite hold up to its contemporaries, at least not to my ears. I believe this genre is typically loved by people of my age. Is Alice Cooper Glam? Well, I do not know, I do not think so. But ... as a young boy ... how many times have I listened to "school's out" and "(I wanna be) ELECTED"
mestreech and LeBon Bush like this. Here in the US, one of the few Slade songs that I recall getting airplay was ‘Goodbye to Jane.’ It was ok, but it sounded much like T. Rex, Bowie, Mott, etc. So it was a bit hard for Slade to distinguish themselves from their peers (at least on US rock radio). Big fan here. Actually, their Hard Rock have nothing to do with Glam Rock genre of the 70s' David Bowie, post-1972 Elton John and Roxy Music, while due to Slade's funny costumes, they were tagged as "Glitter Rock" back in the day, together with Gary Glitter, The Sweet and Mud. Besides of their amazing songs, they were also great live attraction. I saw Slade live in 1979 and it was one of the best concerts I attempt in my life. My all time favourite song by Slade is power ballad How Does It Feel released in 1975 on 7" vinyl by Polydor Records. MonoStereo, Randoms, Rufus McDufus and 1 other person like this. I think Glam was very much a visual style, a fashion that pervaded from about 1971 - 1974, more than a specific musical genre. There were artists who were exclusively Glam like The Sweet or The Glitter Band but there were also many that embraced the visual style while it was fashionable but moved on like Bowie, Elton, Mott the Hoople, even Marc Bolan and Abba in their early days. Mud and Suzi Quatro were of that era but not really visually Glam. Slade at their best transcended Glam and were really a proto NWOBHM band who sustained a career long after Glam had faded. There was nothing Glam about them by the time their 80s hits rolled around and they were already trying to shake it off as early as In Flame (my favourite Slade album along with Til Deaf Do Us Part). Purple, Randoms, JumpinJimF and 1 other person like this. Well I think Alice Cooper certainly is glam (other notable US glam acts were New York Dolls and Jobriath). 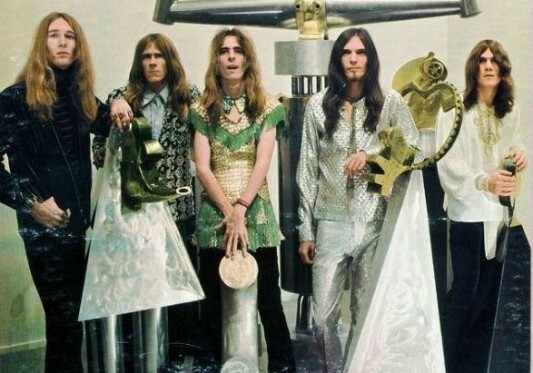 As for Slade, great band between 1971-74, I grew up with them as a kid. Despite people claiming that period was all about Pink Floyd's DSOTM and Led Zeppelin, what I remember from memory is that, at least in Europe, Slade were the most visible act, dominating the airwaves and music programs on television. In 1973 alone they had like four #1 chart toppers in most countries on the continent. Randoms, Rufus McDufus and siebrand like this. Oh yeah, one of their best songs for sure. Jonny W, LilacTeardrop, Hammerpeg and 2 others like this. Sweet exclusively Glam, eh what !!! Have you never heard their B sides, they're really HEAVY, so unlike the pop twaddle of their A sides.. I'm certainly not dissing Sweet. I like them and some of their A sides are far from pop twaddle once they got past the silly Little Willy and Wig Wam Bam phase. Hellraiser and Love Is Like Oxygen remain two of my favourite singles of all time but they never really escaped their image, at least not in the perception of the wider public. Another Slade's power ballad that is fantastic. Everyday was released in 1974 on 7" single in the UK, Ireland, across Europe, Australia, New Zealand, Japan and South Africa. MonoStereo, Dave Decadent and Randoms like this. was it the age I hade in the seventies? But i liked them... I liked Sweet. I preferred Slade, oh yeah, but Liked Sweet too! Hammerpeg, Bemagnus, Rufus rag and 6 others like this. I was born in 75 and love most 70's glam! Man at C&A likes this. yeah... Noddy Holder was really great. Noddy Holder is a great vocalist. After AC/DC's Bon Scott's untimely death there were many rumours that Noddy would be his replacement. After Holder declined, they eventually settled on ex-Geordie singer Brian Jonhson, who basically was a Noddy clone. Rufus rag, Dave Decadent, Man at C&A and 2 others like this. I was born in ‘77 but always had a penchant for all things early seventies. I remember being repeatedly disappointed when I went to 70s nights at university that they only played disco with a smattering of Abba. wrappedinsky and TheLoveDrags like this. After AC/DC's Bon Scott's untimely death there were many rumours that Noddy would be his replacement. Dave Decadent, Sandinista and grouploner like this. He should've been terrific with AC/DC, but Noddy turned the offer down due to his loyalty to Slade (keep in mind that at the time AC/DC was still an upcoming band, and it was not guaranteed at all their popularity would not take a nosedive after Bon's demise). JumpinJimF Got mashed potatoes. Ain’t got no T-bone. 3. The followers: Mud, Glitter etc. 2 and 3 got a bit lumped together at the time but hindsight has been kinder to the Motts and Slades of this world. Ludger, trumpet sounds, Randoms and 1 other person like this. disparaged as "*** rock" by the metal-heads and rednecks. I used to like to call it "tall-shoes music". I like a lot of music that’s from this era and lumped in this genre. I think I’m more of a fan of The Sweet than I am of Slade, but have plenty of both in my collection. Anyway, Bowie, Roxy, T. Rex, Alice and Mott are amongst my favorite artists. Other artists jumped on the band wagon, or had their glam moments....Elton, Rod, and The Stones. It’s Only Rock n Roll...But I Like It. 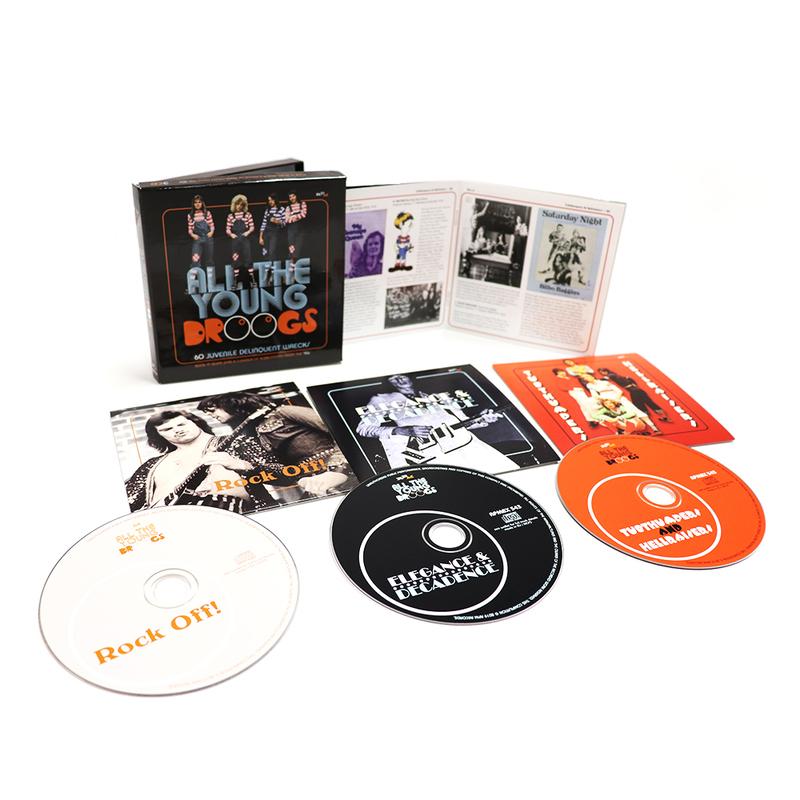 Great Glam box set (various artists) recently released by Cherry Red Records. Highly recommended. Ludger, PhantomStranger, Dave Decadent and 3 others like this.